The Lexus HS was launched by Lexus in 2009 as an entry level compact hybrid sedan, after being unveiled at the North American International Auto Show in 2008. According to Lexus, the acronym HS stands for Harmonious Sedan. It was the first dedicated hybrid model under the Lexus brand. The HS 250h was also the first Lexus hybrid with an inline-4 gasoline engine. In terms of size, Lexus HS 250h fits right in between the larger Lexus ES and smaller Lexus IS. Lexus HS had many eco-friendly selling points apart from the hybrid engine, one of which was the use of Bio-plastic material in vehicle’s interior. Lexus HS shared its platform with the 3rd generation Toyota Avensis. The Lexus HS 250h is powered by a 2.4L inline-four engine that independently produces 147 hp. In combination with electric motor, the overall power output is 187 hp. 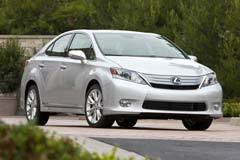 The hybrid drive train used in Lexus HS is similar to the one used in a hybrid Toyota Camry. HS can go from 0 to 60mph in 8.4sec and has a top speed of 112mph. Lexus HS offers 3 driving modes: EV, Eco and Power modes. EV is pure electric mode, Eco is hybrid mode for high fuel efficiency and Power is pure gasoline mode for better performance.